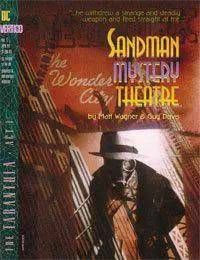 Sandman Mystery Theatre is a comic book series published by Vertigo, the mature-readers imprint of DC Comics. It ran for 70 issues between 1993 and 1999 and retells the adventures of the Sandman, a vigilante whose main weapon is a gun that fires sleeping gas, originally created by DC in the Golden Age of Comic Books. In a similar vein to Batman, the Sandman possesses no superhuman powers and relies on his detective skills and inventions.<br />In this film noir-like series by writers Matt Wagner and Steven T. Seagle, Wesley Dodds (the Sandman) and his girlfriend Dian Belmont (daughter of the District Attorney) encountered several, often grotesque, foes in multi-issue storylines. The team of Dodds and Belmont were a nod to Nick and Nora Charles of The Thin Man novel and movies.